The ride includes a number of sites to explore along the way. Begin the Ride at the corner of West Maple Rd and Cranbrook in Bloomfield Township. Follow Cranbrook Rd. North through the neighborhood to Quarton Rd. (16 Mile Rd). Beautiful suburban homes line a well-paved slightly curvy road. At Quarton turn Left and proceed about a quarter mile to Dunston Rd. Follow the winding Dunston Rd. about ¾ of a mile until you reach Church Rd. A left turn on Church Rd. brings you to our first stop of the ride. 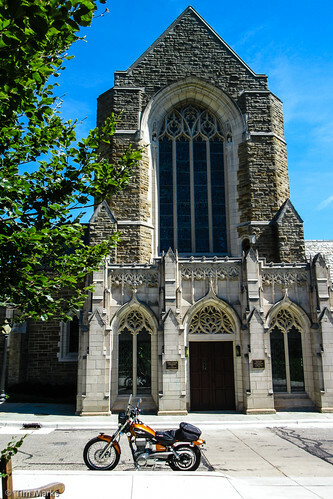 Christ Church Cranbrook: established in 1925, the Goodhue and Associates designed Episcopal Church was dedicated in 1928. Stop and wander around the grounds. Statues of famous personages adorn the outer walls of the church. Statues depict Protestant theologians such as John Wycliffe and William Tyndale, explorers such as Jacques Marquette SJ, American founders such as George Washington and William Penn, and a host of others. If the church is open step inside to see this architectural gem. To continue on your ride, turn left from the church lot onto Lone Pine Rd. and head west. On your right is the Cranbrook Educational Community that I will discuss later in the article. Continue west on Lone Pine as trees that line the road hide the large luxury homes from view. At Franklin Rd., the route begins to have some nice easy curves that make this section a pleasant ride. At Inkster Rd. turn right and then follow the sharp left curve to remain on Lone Pine. When you come to Orchard Lake Rd. make a right turn and continue about ½ mile to Pontiac Trail. Turn left and follow Pontiac Trail about ½ mile to Old Orchard Trail. Turn Right on Old Orchard Trail. Old Orchard Trail follows the south shoreline around Orchard Lake for about two miles with nice views of the lake and Orchard Lake Country Club. The road is in decent shape and incorporates a number of nice curve including a very sharp curve after you pass the golf club. At the sharp curve Old Orchard Trail becomes Hiller Rd. Continue on Hiller to Commerce Rd. 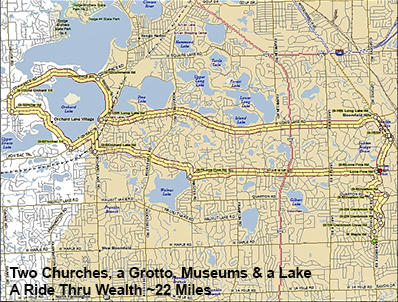 Turn Right on Commerce and ride along the North Shore of Orchard Lake about two miles to Indian Trail Rd. Turn Right on Indian Trail and we come to our next stop. On your left will be the Orchard Lake Schools Campus. 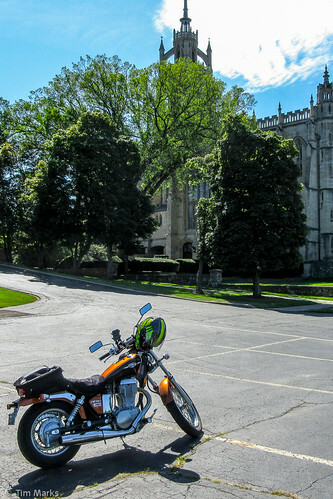 The Catholic Educational campus includes a high school, Seminary, and liberal arts college. Slightly back from the road at the campus, entrance is a small grotto. This is a nice spot to stop rest and reflect. Follow Indian Trail to Orchard Lake Rd. and turn right, continue to Long Lake Rd. and turn Left. Long Lake is a six-mile stretch of mostly straight, newly paved, smooth riding. It is not particularly exciting but the speed limit is 50 mph, which allows you to get some wind in your face. About half way along Long Lake, we come to our next stop. Kirk in the Hills Presbyterian Church is a phenomenal beauty. Built to emulate the 13th century Melrose Abby in Scotland, the church is set on Island Lake. The magnificent facility opened in 1958 and the congregation competed an educational annex in 1965. Walk around the church and admire the beauty of the setting and the building. Behind the church building, you find a number of sculptures by Marshall Fredricks, sculptor of the “Spirit of Detroit.” I have never had any issues taking photographs of the outside of the church but it is my understanding that the church prohibits photographs inside the sanctuary. Return to Long Lake Rd. and continue east until you arrive at Woodward Ave. Turn Right at Woodward and follow it until you reach the entrance to the Cranbrook Educational Campus. The Cranbrook campus includes a wonderful garden and two museums. The Cranbrook Art Museum is one of Michigan’s pre-eminent museums of modern art and the Cranbrook Institute of Science has wonderful programs for all ages. 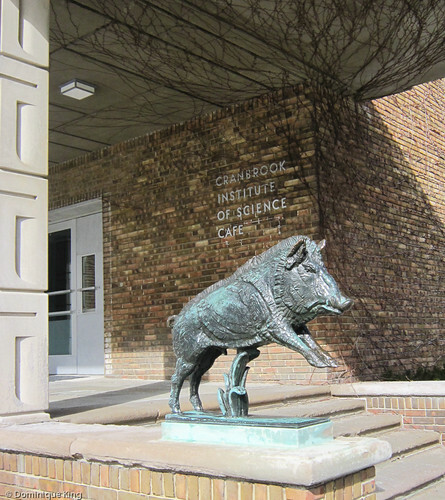 A number of serious academic scientists developed their love of science at the center. Return to Woodward Ave and continue south for about 200 feet to Cranbrook Rd. Turn right go about ¼ mile and you find yourself back at Christ Church Cranbrook. This ride can be a fun hour ride or a nice excursion touring some interesting and educational sites.